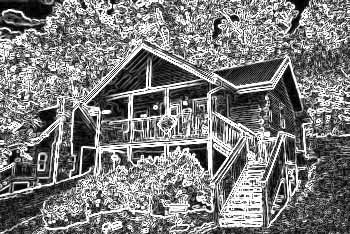 Welcome to our Elk Cove Cabin Rental list featuring prime Elk Cove Resort Gatlinburg cabin rental properties nearby the famous Glades Arts and Crafts community; with easy access to downtown Gatlinburg shopping, dining, attractions and entrance to the Great Smoky Mountains National Park. Whether your favorite pastime is soaking in a family sized hot tub on the cabin's deck or cooking a meal outdoors with the family over your cabin's grill, Cabins USA has Gatlinburg cabin rentals sure to satisfy your taste and budget. While visiting the Smoky Mountains area be sure to visit Ober Gatlinburg Ski Resort. Their more than a winter recreation center with several outdoor activities, stores, eateries and indoors ice skating year-round. Maybe your family or group is searching for a cabin in the Smokies next to some of the area's biggest attractions, Cabins USA offers several cabins in Pigeon Forge and Sevierville Tennessee next to Dollywood Theme Park, Dollywood Splash Country and dozens of other outstanding Pigeon Forge attractions. Remember to book your Elk Cove Resort cabin rentals online with Cabins USA, for your Discount Cabin Rate, and start planning your romantic getaway, honeymoon or family vacation to the Smoky Mountains!